Set includes (1) base, (1) rod, (1) beaker tong, (1) crucible tong, (1) tripod stand, (1) wire gauge, (1) bosshead, (1) clamp, (1) retort ring with bosshead, (1) burette clamp double, (1) test tube holder, (1) test tube stand (z-shape), (1) test tube brush, and (1) spatula. 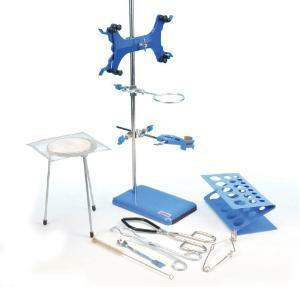 This premium lab set is ideal for starting a home lab or in a classroom setting. It has all the components needed to start a basic chemistry lab.